In large bowl, beat cake mix, water, oil and eggs with electric mixer on low speed 30 seconds, then on medium speed 2 minutes. Pour into pan. Bake 30 to 38 minutes or until toothpick inserted in center comes out clean. Let stand 5 minutes. In large bowl, mix 1 cup whipping cream, the whole milk, condensed milk and 1/3 cup rum. Pierce top of hot cake every 1/2 inch with long-tined fork, wiping fork occasionally to reduce sticking. Carefully pour whipping cream mixture evenly over top of cake. Cover and refrigerate about 3 hours or until chilled and most of whipping cream mixture has been absorbed into cake. In chilled large bowl, beat 1 cup whipping cream, 2 tablespoons rum and the vanilla on high speed until soft peaks form. Frost cake with whipped cream mixture. Sprinkle with coconut and pecans. Store covered in refrigerator. 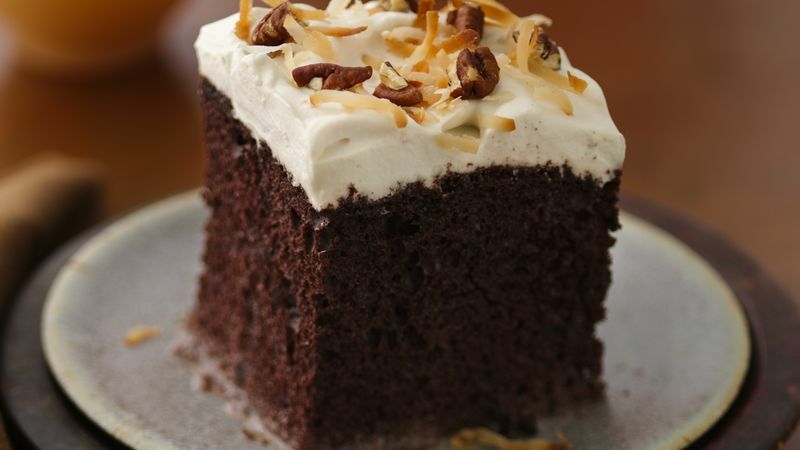 Instead of rum in the cake, use 1 tablespoon rum extract plus enough water to measure 1/3 cup. In the topping, substitute 1 teaspoon rum extract for the rum. In Spanish, tres leches means "three milks." The milk trio in this recipe is whipping cream, whole milk and sweetened condensed milk.